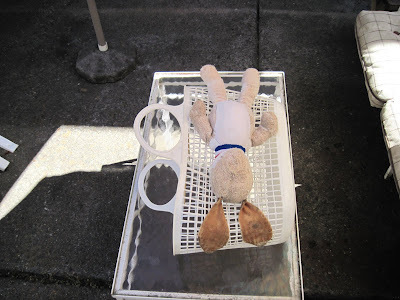 ~ THE LAZY VEGAN ~ HOME OF PACO & LUIGI AND FRIENDS: Special Guest Blog Post with Old Snoopy...and Look Who is in the Kitchen Sink! 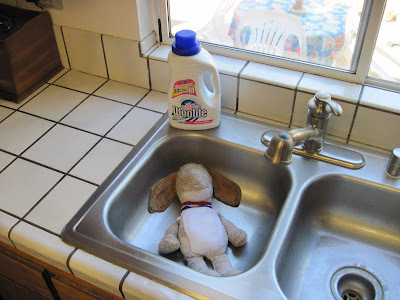 Special Guest Blog Post with Old Snoopy...and Look Who is in the Kitchen Sink! 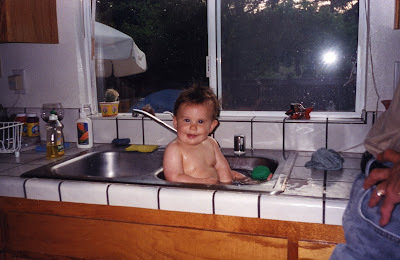 My nephew Drew makes good use of his grandma Snap's kitchen sink in 1999- just as "Old Snoopy" will in the photos to come! 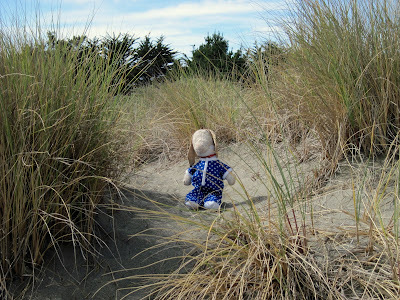 Old Snoopy relaxes in the grasses of the beach dune. 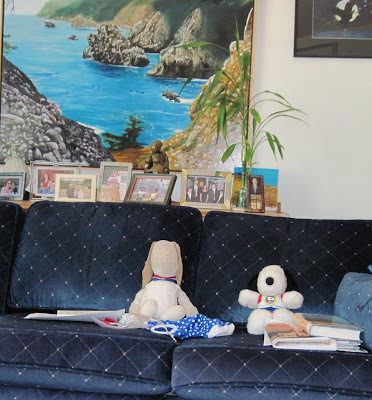 As some faithful blog readers already know, "Old Snoopy" is the stuffed animal belonging to my sister, and he is rapidly approaching an ancient age. During his senior years, his grandma Snap has spent hours upon hours carefully repairing his threadbare body. She uses only the finest yarn, and bathes him by hand. 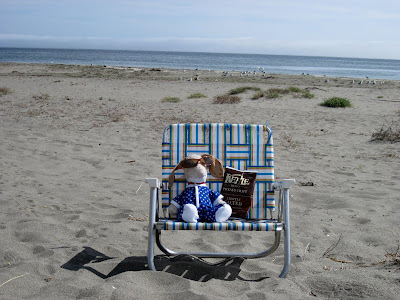 On this most recent repair visit with Old Snoopy, she took him on a beach outing where they spent quality time together inbetween sewing sessions. 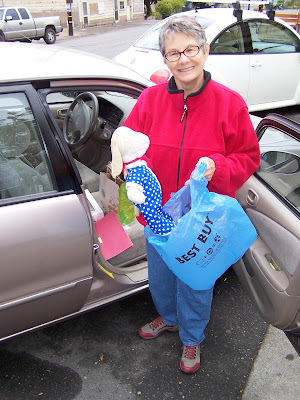 My favorite mental image of that outing (from what I was told) was when Grandma Snap ran with Old Snoopy tucked in her arms to try to frame a photo of a boat speeding by in the background...and she noticed two women looking at her oddly. Even though my entire extended family is used to the rather mummified sight of Old Snoopy, it is a shock to see him for the first time...his featureless face is hardly that of a traditional Snoopy. 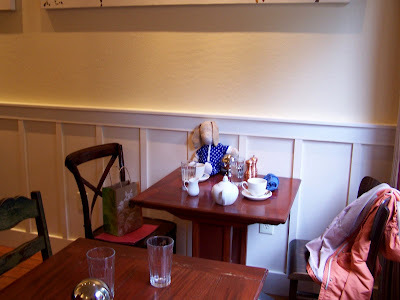 He lost all his features in a laundromat outing decades ago, along with his friend Snappy...but that is altogether another blog posting story. 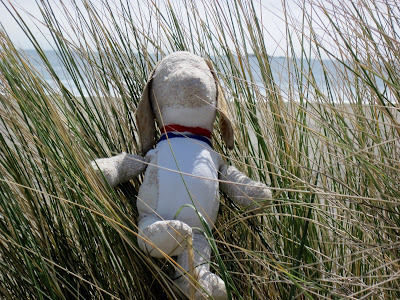 At any rate, today's blog is dedicated to Old Snoopy and to Grandma Snap...faithful sewing partners and beach-goers for many years to come! These photos are a bit out of order...I can't always control the order for some unknown reason. Above, Old Snoopy relaxes while he air dries in Grandma Snap's back yard. 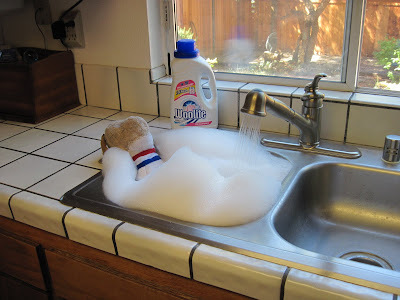 Just like Drew, Snoopy enjoys a bubble bath in the kitchen sink! 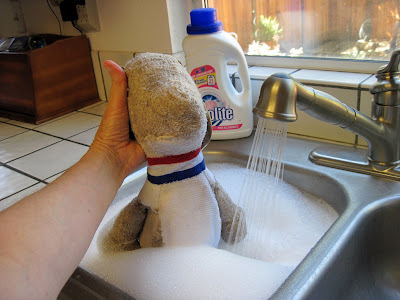 Note his head is carefully held high above the sudsy water. He does fit the sink perfectly! 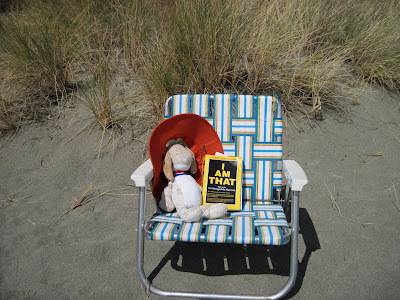 Old Snoopy borrowed one of Grandma Snap's "self-help" books to enlighten himself while at the beach. He's being protected from the hot sun with a nifty hat. Some down-time with a fellow Snoopy friend on Grandma Snap's couch. Once again, I apologize for the out-of-order photos! 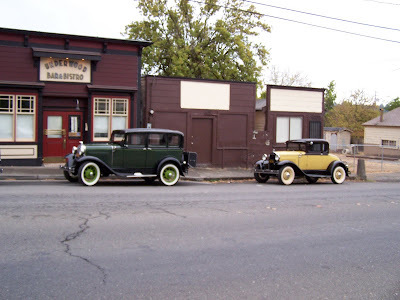 These were vintage cars parked outside the cafe in Graton, where Grandma Snap and I meet every Saturday like clockwork, do our run/bike ride, and walk to the very same table in another cafe and order the exact same thing - coffee (Snap) and peppermint tea (me). 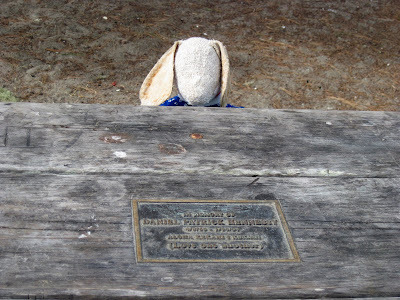 Old Snoopy visits Uncle Dan's memorial picnic table. Sorry, Dan. Even though you're in Heaven, there's no escaping Snoopy!! Snoopy walks down the sandy path. 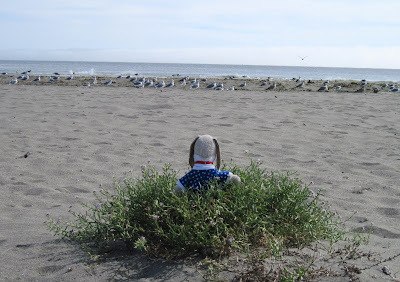 Snoopy meditates with the seagulls. 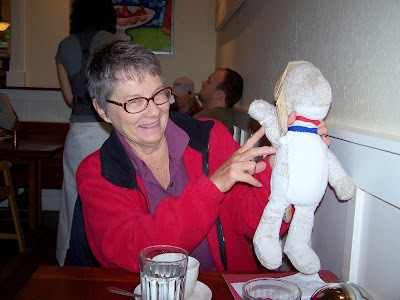 At the cafe, Grandma Snap pointed out the recently repaired parts of Old Snoopy. It was great having Old Snoopy join us! 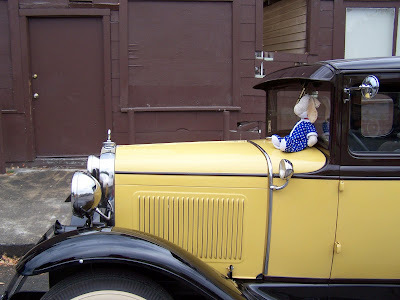 Despite the fact that the vintage car owners were all watching from a front table inside the cafe, Grandma Snap let Old Snoopy perch on one of the cars for a photo opportunity! 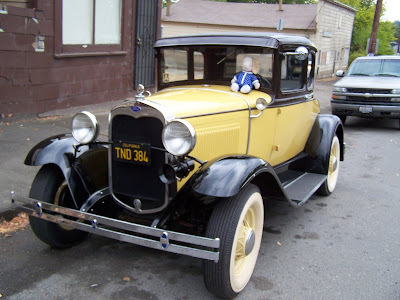 Old Snoopy is not unlike a rare, antique car! Due to the rainy weather, Old Snoopy arrived safely tucked in a plastic bag. More of Old Snoopy to come in the future...because the Old Snoopy renovation job is a lifetime project! 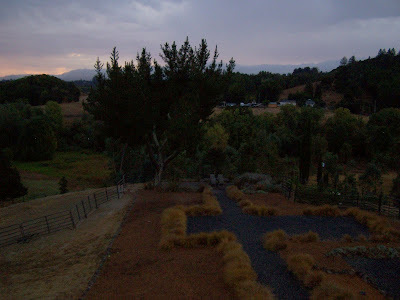 On a final note, all last night we had lightning and thunder at The Lazy Vegan...the animal crew was up at different times all night, too...and I found the donkeys huddled in the corner of the barn in the wee hours of the morning, while lightning flashed around us...pretty dramatic!